Far away in Finland, where the ice is plentiful and the temperature is bitter cold, the Finnish Nokia team have created the world's first touchscreen display made entirely of ice. Constructed with massive slabs of river ice, the display was first shaped into neat square slabs with a chainsaw, and then smoothed into a watchable surface with a powerful heat gun. 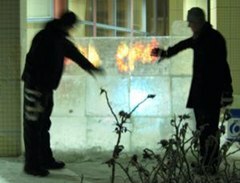 "The team made their wall an interactive one by using digital projection technology, rather than peppering the ice with sensors that would raise the cost of the installation... The icescreen uses rear-diffused illumination (RDI), a technique first used by Microsoft in its table-based interactive touchscreen, Surface, launched in 2008. A near-infrared light source mounted behind the 'screen' bathes it in invisible light, and an array of near-infrared cameras, also behind the wall, are focused on the front surface. A hand placed on the ice reflects the light towards the camera array and the signal each camera receives helps a nearby PC establish the hand's position, size and motion. The PC is also connected to a projector, which uses the data to project imagery - such as flames - beneath the user's hand." Previously, Touchpad Made with Paper and Pencil Scribbles. It is not clear enough to be used for interactive displays or advertising.